Open from 9.00 to 18.00. Before 11.00 or after 15.00. 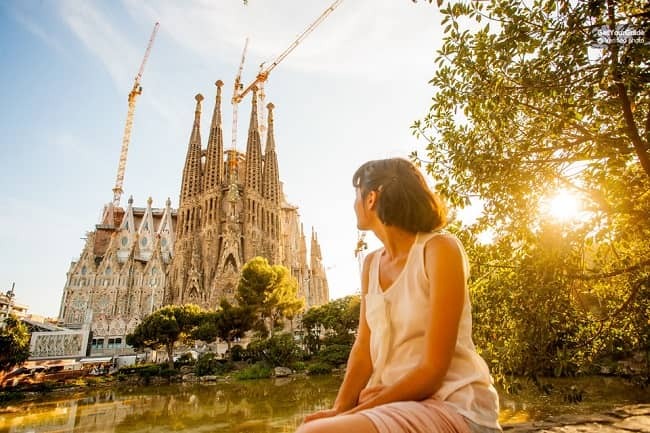 We are comparing Skip the line Barcelona Sagrada Familia Tour Ticket Prices from leading ticket suppliers and Try to find you Cheap tickets prices on the market. This is a great opportunity for independent travellers to visit the world-famous Basilica de la Sagrada Familia. This is a basic ticket, with optional add-on's such as audio guide, guided tour or tower access, which gives you the flexibility to create your own personalised itinerary. Meet at the fast track entrance to La Sagrada Familia. Instead of wasting your vacation waiting in line you can skip the queue and enter directly at your allotted time slot. Once inside you're free to stay until closing time. Admire the gorgeous stain-stain glass windows and unique combination of Art Nouveau and Gothic architecture. Decipher the intricately designed facades and stone columns depicting nature, nativity scenes, and the Holy Family. You can also check out the progress of this ongoing construction and compare to the original plans in the Underground Museum. The onsite museum will teach you about the life of Antoni Gaudi and the facts behind his cathedral, or you could pick up an audio guide at the entrance (not included) for a more detailed description. If this is your second visit to La Sagrada Familia you can enjoy this independent tour with a skip the Line entrance ticket. Ideal for art and history enthusiasts, you will be able to explore at your own speed and have the option of renting an audio guide at the entrance. Your Experience With Skip the line Barcelona Sagrada Familia Tour Ticket? Benefit from a combined skip the line and entrance ticket, including access to the onsite museum. Visit the most famous Roman Catholic Cathedral in Spain, La Sagrada Familia, and marvel at the splendid art works, stone carvings and stain-glass windows. Explore this iconic site at your own pace, take your time to appreciate the life and works of Gaudi and his unique Cathedral. What Skip the line Barcelona Sagrada Familia Tour Ticket Includes? Fast track skip the line entrance ticket to La Sagrada Familia. Admission to Basilica and access to the onsite museum. Travelers Reviews about Skip the line Barcelona Sagrada Familia Tour Ticket? This tour has fantastic reviews from travellers who have visited the cathedral. Get Your Guide users have given the attraction 4.7 out of 5. The tour has a 4.5-star rating on TripAdvisor and a strong 5-stars on Viator. Comments generally agree that the cathedral is one of the most beautiful places to visit in Barcelona an should be on everyone's wish list. Your ticket is valid only for your selected time slot, tickets are not refunded if participants arrive late and are denied access. Mobile or paper tickets are accepted. Most tickets are fully refundable up to 7 days prior to departure. Tickets may still be refundable less than 7 days in advance, please check with tour provider before making your booking. Please wear comfortable shoes, you will descend from the tower via the spiral staircase and stones may be uneven. All visitors must wear appropriate clothing which covers knees and shoulders. This is a religious building and entrance can be refused to visitors who do not meet the required dress code. Audio guides can be rented at the entrance, they are not included in the ticket price. Access to the towers is not included. Please be a meeting point 10 minutes early. Meeting Point: Fast track entrance, La Sagrada Familia, Carrer Mallorca, 401, Central Barcelona.